Inspired by Korean innovation, an ultra-thin fibre sheet mask designed to fit seamlessly on the face and enhance the moisture content within the mask leading to an increased absorption rate within the skin. 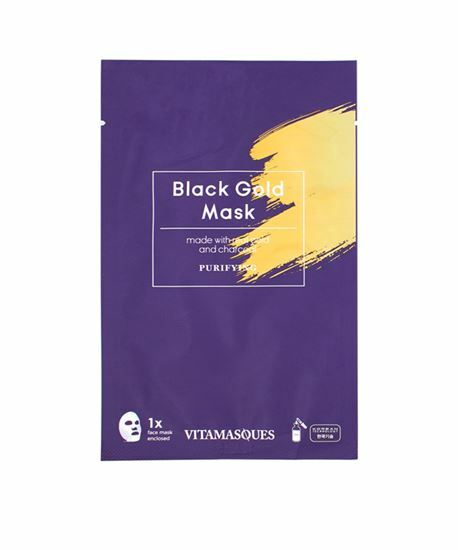 A rare skincare solution from VITAMASQUES, our Black Gold mask is specially put together for aiding your skin by absorbing impurities that get embedded in the skin from daily exposure to environmental elements. The mask also detoxifies due to the activated bamboo charcoal extracts in the serum. This helps your skin feel tighter, purified and less prone to breakouts.The mask refines skin texture and will leave you with a delightful experience that calms your senses as you pamper yourself during your in-home spa treatment. The earliest documented use of bamboo charcoal dates back to the Ming Dynasty. Chinese healers used “the black diamond” to formulate medicines and filter water for tea. The charcoal also “sweetened” the tea by infusing minerals such as calcium, magnesium, and potassium. This mask will also infuse your skin with these much needed basic elements. Moisturising + Hydrating Contains Real Gold Dust Contains anti-inflammatory properties Boosts anti-oxidants in your skin Real extracts of Bamboo Charcoal extract Purifies skin of toxins by absorbing into the mask Leaves skin feeling cleansed and firm Essential mask for a healthy and firm complexion Made in South Korea.